This is an easy morning’s or afternoon’s walk of 14.km (8.5 miles), taking you to one of the earliest church-sites in Cowal. Kilfiinan church is built on the site of its medieval predecessor, and has a fine collection of medieval carved stones, including some rather early ones. It is well worth a visit. 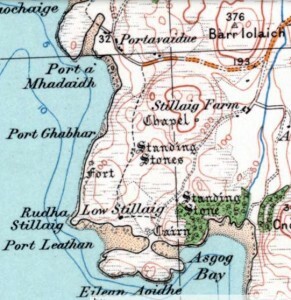 Start at Portavadie (Gaelic Port a’ Mhadaidh ‘port of the dog’). You may be there because you have just taken the ferry to Cowal from Tarbert in Kintyre. Or perhaps you have arrived in Cowal in your own boat and have moored at the fine marina at Portavadie. Either way, welcome to Cowal. Why not have a look around Portavadie while you’re here? You can take a boat-trip to look at some of the rich marine wildlife in the area – including basking sharks, sea-birds, dolphins, porpoises and occasional minke whales. There are plenty of places to stay and eat around here too. 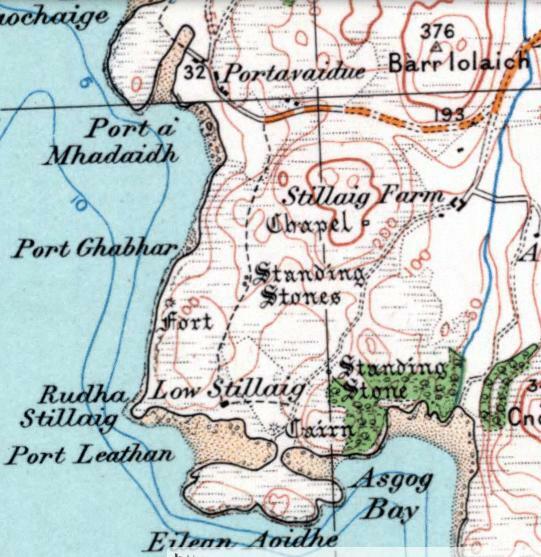 About 3km easy walk to the south-east there are the remains of an old chapel on a grassy hillock, on the farm of Stillaig. There is little to see here, but it is a pleasant walk in this direction. And if you continue south past the chapel for another 1.5km you will come to a lovely little peninsula or promontory, Eilean Aoidhe. The name contains Gaelic eilean ‘island’, and the survival of an Old Norse word, eið ‘isthmus, a narrow neck of land’ – which is exactly what defines this lovely spot. You can also hire bikes at Portavadie, allowing you to stay here while you explore this part of south-west Cowal, going further afield each day than you would if you were walking. If you are walking, take the road east from the ferry terminal, going uphill past the marina. After about 400m you’lll find a forest path with signposts for Loch Asgog and the Cowal Way. Follow this path up the hill, through a ford, taking a right-hand path at Derybruich, keeping the farm on your left and going down to Asgog Loch (and the remains of a castle on its western shore). Keep up the west side of the loch on the path, turn with the path to the east along the northern shore … and then the path disappears, and you will be heading east across some rough (and sometimes boggy) ground for about 350m. Then you will find youself on the track of Auchoirk Cottages (above you on the left). This track will take you to the B8000, a narrow road. Here turn left (thus departing from the course of the Cowal Way, which goes right), and you can now follow this road north all the way to Kilfinan. Cyclists take the road east from Portavadie Ferry, and continue on it (ignoring the Cowal Way path) to the Millhouse crossroads. There turn left, taking the B8000 northwards all the way to Kilfinan. Whether walking or cycling, a slightly more adventurous route would involve coming out of Portavadie and taking the Cowal Way footpath (as for walkers above, but cyclists may have to dismount and push for 200m here) as far as Derybruich. But instead of taking the right-hand track at Derybruich, stay on the forestry track going left, up the hill. Ignore turnings to right and left until you get to the T-junction at the base of Creag an Fhasgaidh (‘rock of shelter/protection’) at NR935721. Here turn right and follow the track north-east then north. It will take you to the B8000. Turn left, and go north – it’s only 7.5km further to Kilfinan. Adjacent to the church is a good place to eat and drink. The Kilfinan Hotel might be just what you need after your walk, or half-way through a day of cycling.